This copy of Joh Bjelke-Petersen's 1983 campaign poster was sold to raise funds for the Help Joh Campaign in 1991. Joh for PM, 1987. Sticker inserted in the Sun Herald 8 March 1987. Collection of the Fryer Library, University of Queensland. Now, more than ever, Queensland needs Joh and the Nationals for Industrial Relations, 1986. 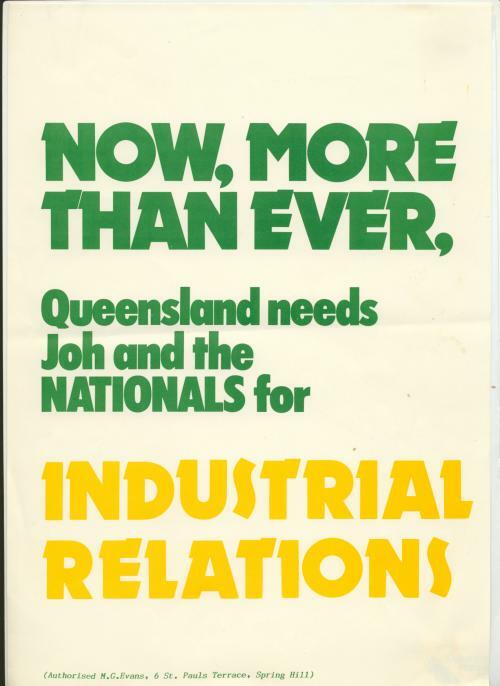 Now, more than ever, Queensland needs Joh and the Nationals for Industrial Relations, 1986.Political advertisement for National Party, Brisbane 1986. Collection of the Fryer Library, University of Queensland.